Around since the early ‘80s as little more than chaotic comic relief, Ambush Bug is to the DC universe what Deadpool is to the Marvel landscape – just without so many guns, a regular ongoing series, or a body ravaged by cancer. He's a geek who happened to stumble upon the last surviving trace of an alien species (a wardrobe) and not-so-gradually lost his mind shortly thereafter. But the Bug is more a vehicle to satirize the industry as a whole than a legitimate character, a chance for his creators to loosen their belt buckles and go wild. Even if it's just a coincidence, the circumstances surrounding this issue continue that pattern. 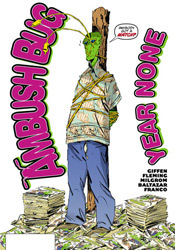 It's been almost a year since Ambush Bug #5 shipped, leaving fans of the character hungry for the final installment of this six-part mini-series. Instead, after eleven months' wait, DC has shipped an unexpected seventh issue instead, using the majority of its page count to wonder aloud about the fate of issue number six. I remember when Spawn did something like that about eighty issues back. If you're curious, Keith Giffen can still be funny. Sometimes he tries too hard and the jokes fall flat, but he's still a genuinely entertaining writer and everybody has their hits and misses. Reunited with Bug co-creator Robert Loren Fleming, Giffen uses his old partner's presence as an inspiration to steer the storyline directly off the tracks, only a few inches outside the station. Like I said, it's funny – sometimes absurdly so – but I kept expecting something to pull everything together in a neat little package and that never happened. It's just Giffen and Fleming musing about whatever springs to mind, whether that's the status of their storied sixth issue, the dawn of modern civilization, Jurassic versions of each of DC's major characters or the publisher's ongoing love affair with large-scale, epic crossovers. There's crazy, there's criminally insane, and then there's Ambush Bug #7. On the few occasions it comes out of the haze and tries to make some jokes, it's quality work. Giffen and Fleming's sense of humor can't be second guessed, but this is so self-indulgent and nonsensical, I'd given up on it just a few panels after the title character said his first line. Good thing, too, because that's right about the point this whole mess becomes completely unbearable. There aren't enough drugs in the world to make this feel right. Skip it.